Challah is a traditional Jewish bread made every week for the Sabbath and for most Jewish holidays. 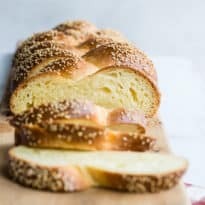 I have an easy Challah recipe that is simple to master. It’s rich and decadent with a beautiful golden color and pillow-soft texture. And that three-strand plait will impress everyone at the table! 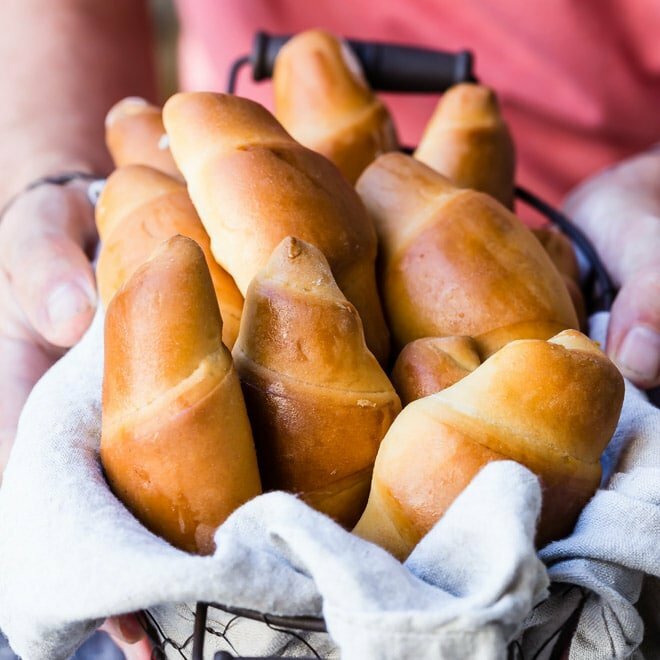 Challah, pronounced “HA-luh,” is derived from the Hebrew word meaning “portion.” It is taken from the Biblical commandment stating that a portion of your dough should be given to the Lord for a gift throughout the generations. 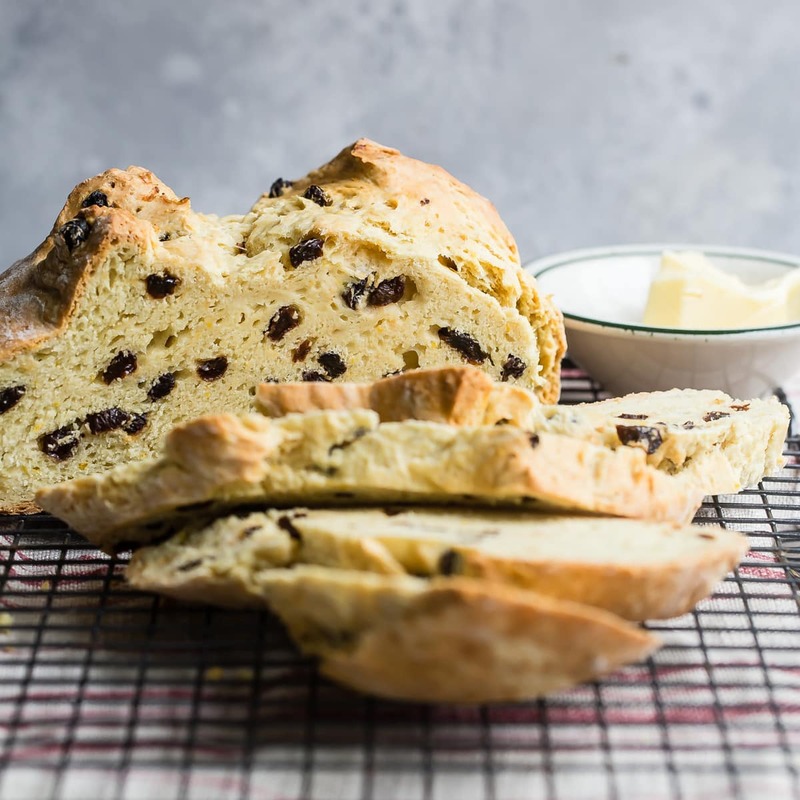 To stick with tradition, many Jewish bakers and homemakers separate a portion of the risen dough (at least the size of an olive), wrap it in foil, and burn it in the oven while baking the bread. How is Challah bread different? Challah, at its root, is an enriched dough. Unlike a traditional white loaf, this means the dough has been enriched with eggs, butter, and/or sugar. 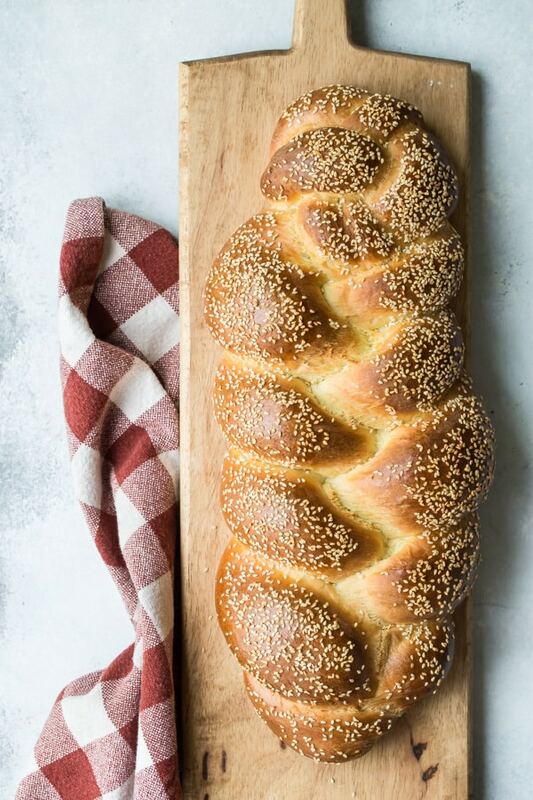 Our recipe for Challah features all three! Challah is actually made in various shapes and sizes depending on the occasion, but the most traditional is the three strand loaf. The strands intertwining one another are meant to symbolize love and each strand represents truth, peace, and justice. Round loaves are baked for Rosh Hashanah, the Jewish New Year. Since a round loaf has no beginning and no end, it is meant to represent the continuity of a year. Raisins are sometimes added and the top can be brushed with honey to symbolize a sweet new year. 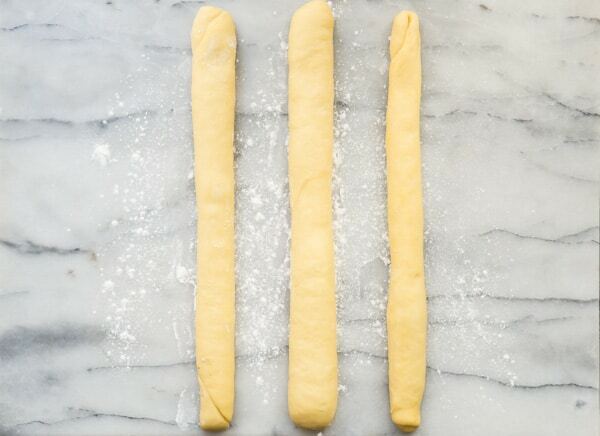 Cut the dough into 3 equal pieces. Roll each piece into an 18 inch log. Form into a three strand loaf by placing the three logs parallel to one another, but perpendicular to you. Starting at the top, pinch the three ends together. Cross the left strand over middle strand. Then, cross the right strand over middle strand. Continue until fully braided, readjusting the strands when necessary. Pinch the three strands together at the end and gently tuck under to create a round edge. Tuck under at the top of the loaf as well. I used to struggle with getting my dough to rise properly. If you live in a cold climate, this can be especially problematic! 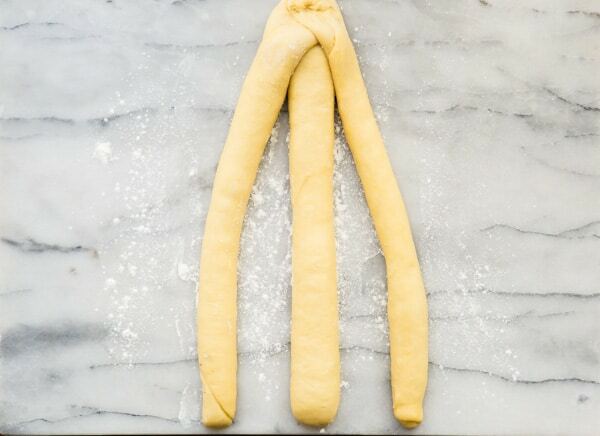 Luckily, you can use your oven to create the perfect environment for proofing (raising) dough. Preheat your oven to its minimum temperature (170 degrees, 200 degrees), but shut it off once the temperature reaches 110 degrees. 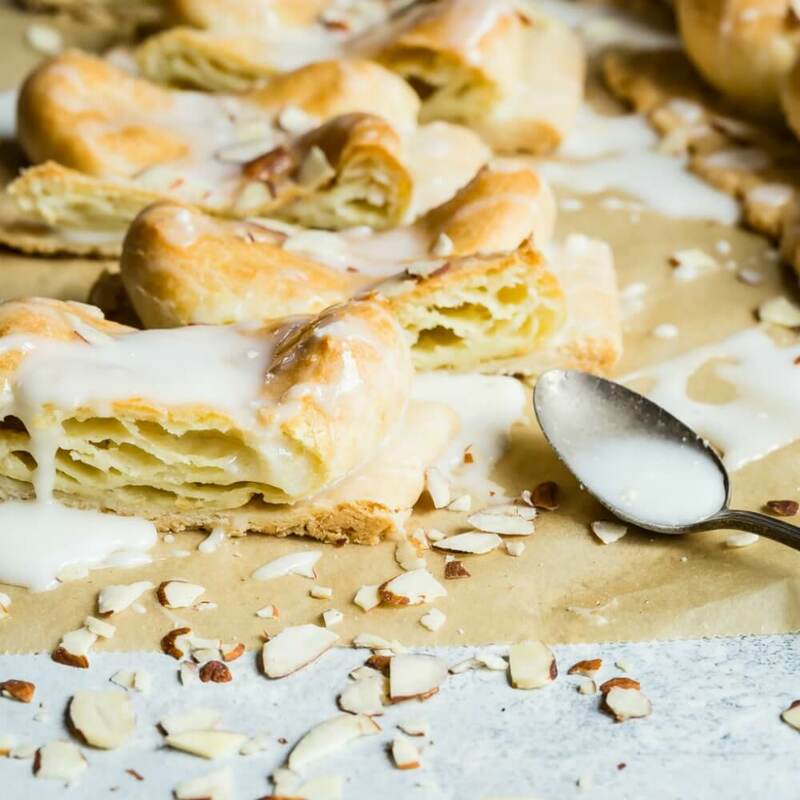 Place your dough (in a greased bowl, covered with plastic wrap), on a baking sheet and in the oven. The oven temperature will drop when you open the oven door, but enough residual heat will remain that your dough should steadily rise. 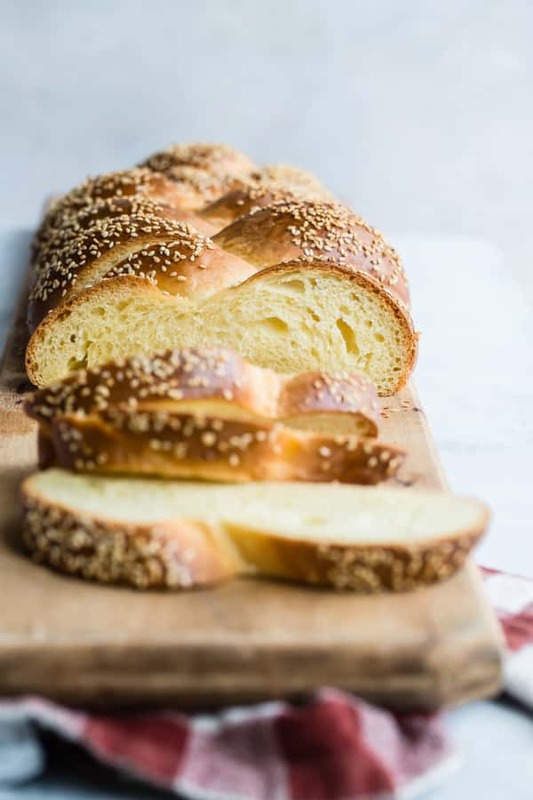 What is the difference between Challah and Brioche? The most important difference is that Challah is part of Jewish culture, so it is Kosher. This means it is not made with dairy so that it can be eaten with all types of meats (Hello, Roast Beef!) 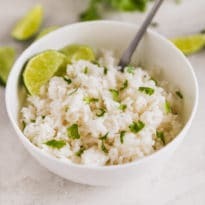 since Kosher tradition does not mix dairy with meat. Brioche, on the other hand, is French, so it is of course made with butter. Yes, the recipe here is made with butter. I am not Kosher, so I do not need to follow the Kosher tradition. 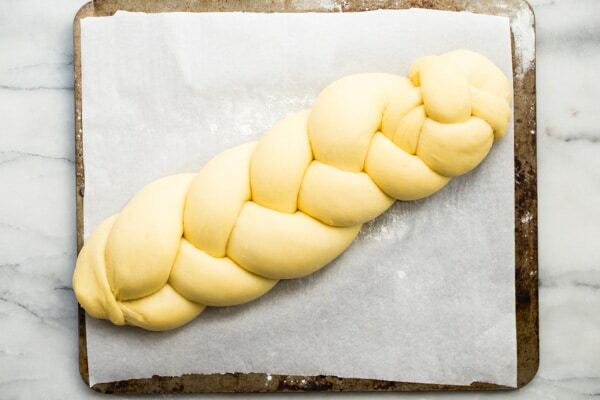 To make Kosher challah, replace the butter with 4 tablespoons vegetable or olive oil. 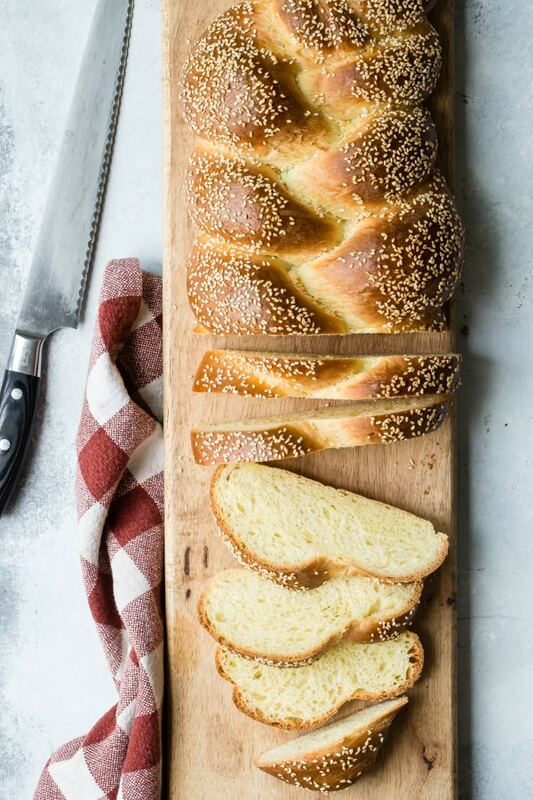 What does Challah bread taste like? The taste is very similar to a brioche bread. The texture is rich and spongy from the egg yolks, with a little tang from the honey. The best way to put it – it’s a little soft, a little sweet, and a whole lot of delicious! 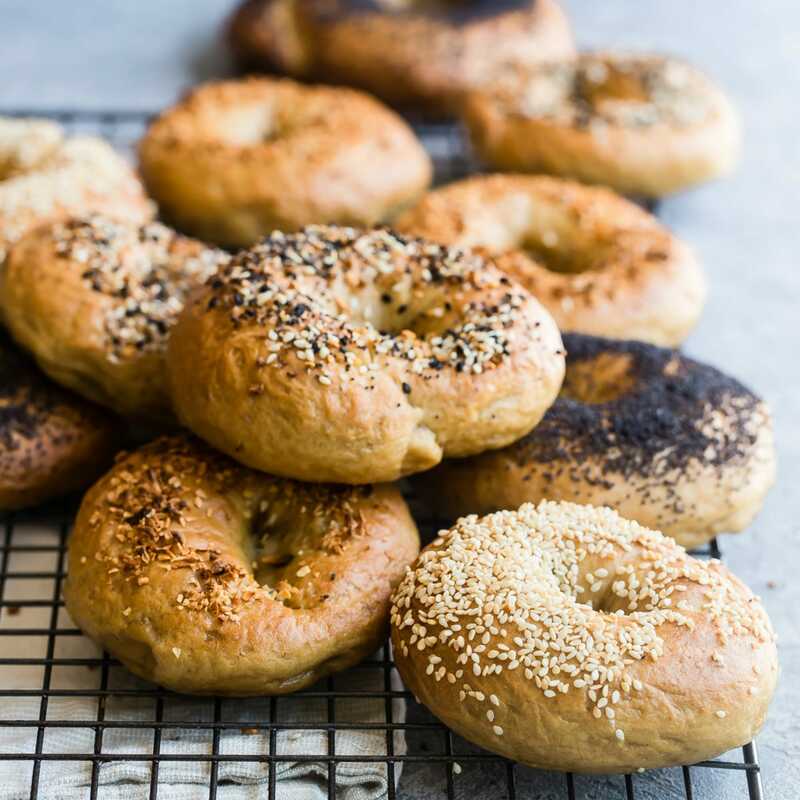 For extra flavor and texture, top your Challah with sesame seeds, poppy seeds, or both! What can I do with leftover Challah? 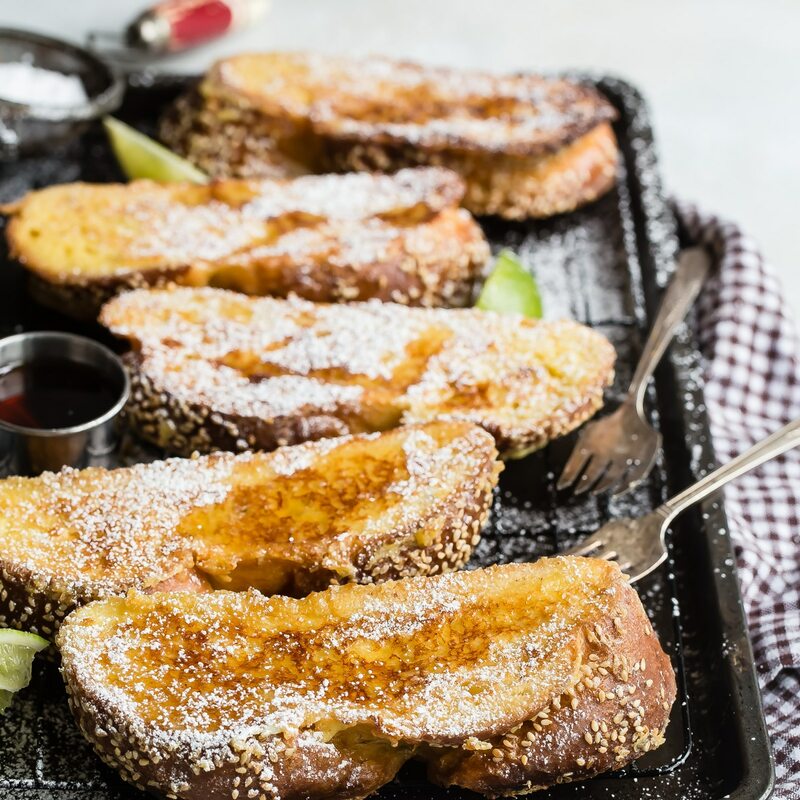 If you happen to have leftovers after several days, Challah makes a beautiful French Toast. 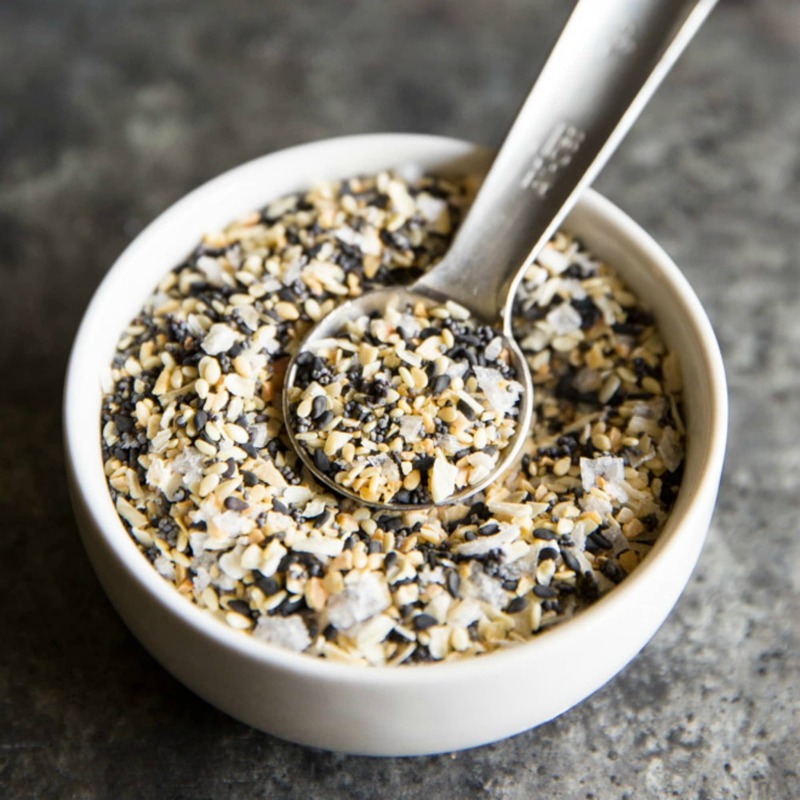 Leave it uncovered on your kitchen counter overnight and make it for breakfast the next morning. Your family and friends will thank you! Mix together the yeast, water, and honey. Soften (bloom) the yeast in warm water for 5 minutes. 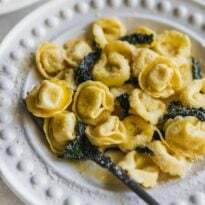 In the bowl of a stand mixer fitted with the hook attachment, combine the flour, salt, butter, and egg yolks. With the motor running on low, slowly drizzle in the yeast mixture. Increase the mixer speed to medium and mix until the dough forms a ball and pulls away from the sides of the bowl, about 2-4 minutes. If the dough seems a bit too wet, add 1-2 tablespoons of flour. Turn out the dough onto a clean work surface and shape into a ball. Place into the same bowl, cover with plastic wrap, and let rise in a warm place (80 to 85 degrees, see notes) until doubled in size, about 1 - 1 1/2 hours. Line a baking sheet with parchment paper. Punch down the dough and pour out onto a lightly floured surface. 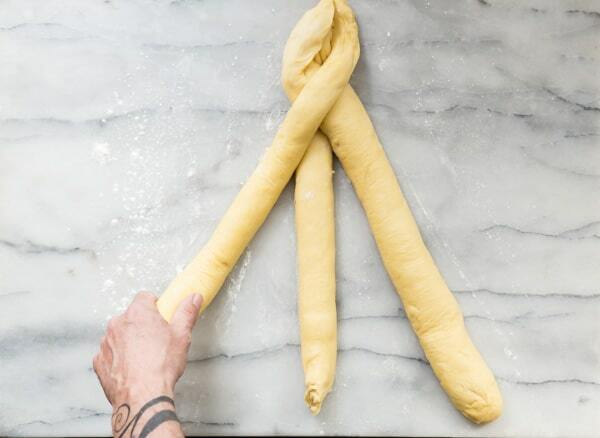 Using a bench scraper or sharp knife, cut the dough into 3 equal pieces. Roll each piece into an 18 inch log. If the dough starts to shrink back as you roll, cover with plastic wrap, and let rest for 10 minutes. Then continue to roll into logs. 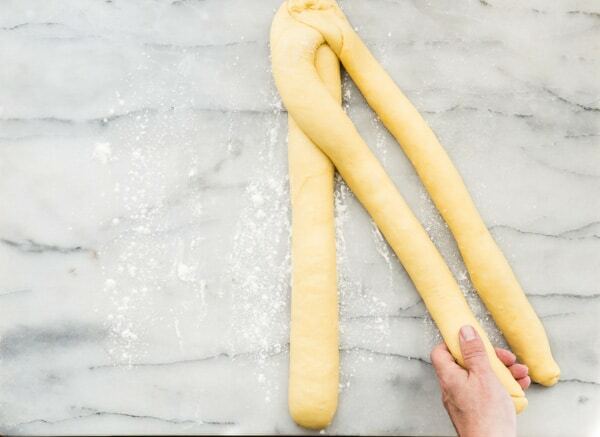 Form into a three strand loaf by placing the three logs parallel to one another, but perpendicular to you. Starting at the top, pinch the three ends together. Cross left strand over middle strand, then right strand over middle strand. Continue until fully braided, readjusting the strands when necessary. Pinch the three strands together at the end and gently tuck under to create a round edge. Tuck under at the top of the loaf as well. 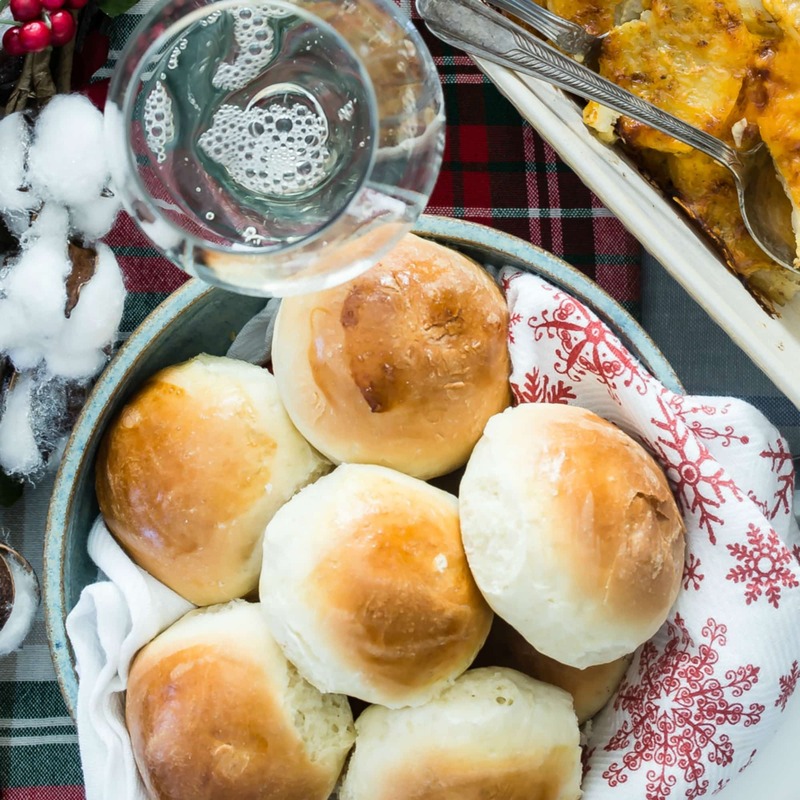 Place the loaf on the prepared baking sheet, cover with a clean kitchen towel or plastic wrap, and place the baking sheet on top of the oven. Preheat the oven to 350 degrees and proof the shaped loaf until doubled in size, about 30 minutes. When ready, brush the entire surface of the loaf with egg wash and generously sprinkle with the seeds. Bake until deep, golden brown, about 25 to 30 minutes, rotating the baking sheet halfway through (the loaf should sound hollow when thumped ). Cool completely on the baking sheet before serving. 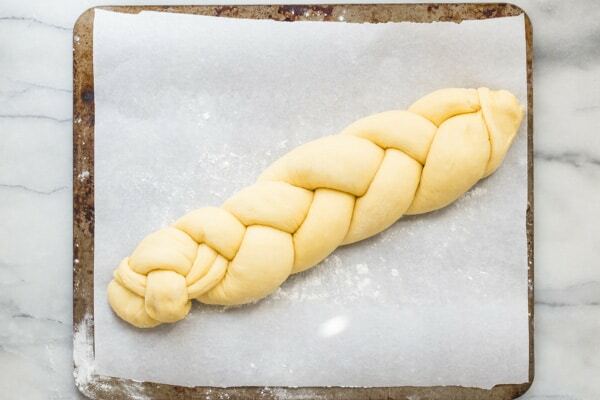 For Kosher challah, substitute 1/4 cup vegetable oil or olive oil for the butter. 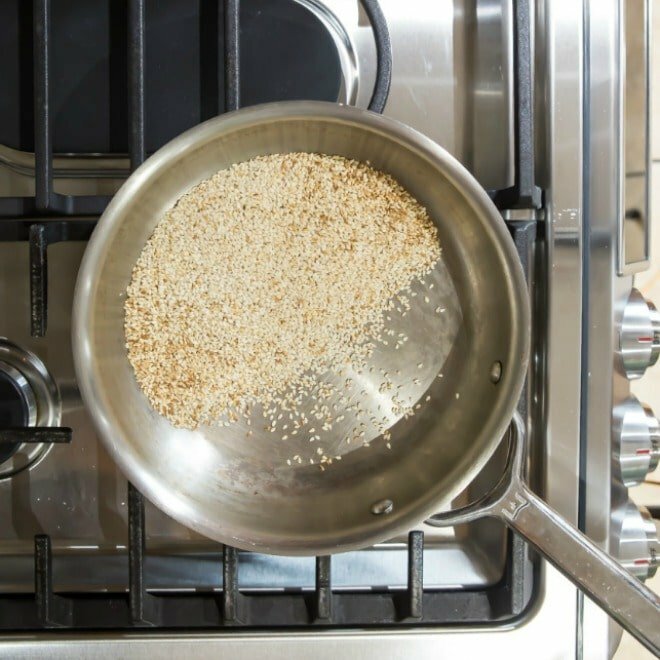 To create a warm environment ideal for yeast-rising, preheat your oven to its minimum temperature (170 degrees, 200 degrees), but shut it off once the temperature reaches 110 degrees. Place your dough (in a greased bowl, covered with plastic wrap), on a baking sheet and in the oven. The oven temperature will drop when you open the oven door, but enough residual heat will remain that your dough should steadily rise.